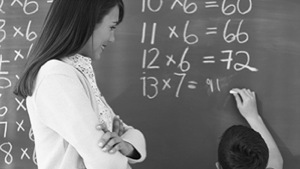 Female mathematics teachers affect the mathematics achievement of female students. JUST MATH increases student achievement using successful role models. Melanie A Sittler conquered her fear of mathematics by obtaining a BS degree in MATHEMATICS from a Division I, Public Ivy League University - The University of Pittsburgh, Main Campus. Melanie A Sittler went on to earn a Master of Science in Educational Leadership and earned a Master of Business Administration (MBA) - Strategic Leadership. Melanie A Sittler holds Instructional and Administrative Certifications in Maryland and Pennsylvania. To learn more about JUST MATH, call 724-449-MATH or click here to obtain additional information.